Video for all + HD! Free or Pro, all of our members can now share video on Flickr. But wait, there’s more. If you’re a Pro member your HD videos are more better. Video for all? Previously limited to our Pro members, video on Flickr is now available for all. Our free account members can now share 2 videos a month (you’ll need to install Uploadr version 3.1.4 — now available from the Flickr Tools page). So, this is a perfect time for you to check out video mode on your camera. Looking for inspiration, why not participate in the Flickr Clock. HD you say? 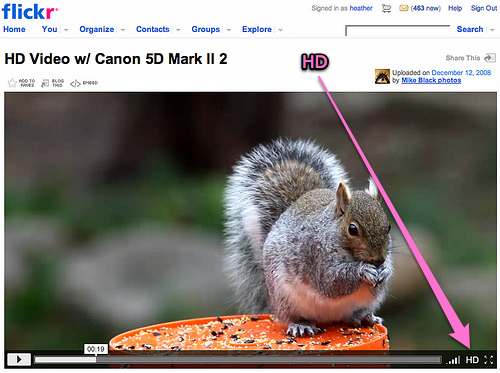 Everyone can now enjoy the HD video that our Pro members share on Flickr. Click on the HD icon in the video player to enjoy. (In the next couple of days, we will have finished re-processing all the HD video that has previously been uploaded to Flickr to make it look more beauteous.) We’ve gathered a few of the team’s favourites in the Flickr HD Video group. All of this video goodness is powered by our friends at the Yahoo! Video Platform team, and has been double-platformitized for the Flickr API, so if you’re into that kind of thing check out Myles! post over at the Code Flickr blog. Be sure to check out our Frequently Asked Questions or head over to our Help Forum topics about Video for free members, HD Video and the new Uploadr. P.S. We’ve lifted the set limit for free members. More about that soon.